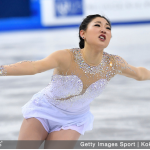 For the second year in a row, Wenjing Sui and Cong Han of China emerged victorious from the pairs competition at the ISU Four Continents Championships, this year held in the newly-built ice arena in Gangneung, Korea, the figure skating venue for the 2018 Winter Olympics Games. China’s top pairs team was returning to competition for the first time this season following a 10-month layoff as a result of Sui’s foot operation. Sui and Han performed their “Bridge Over Troubled Water” as if they had never left, clearly connecting the trials in their program’s vocals into their own experiences building confidence and experience after Sui’s injury. The 2016 World silver medalists had a total competition score of 225.03 points with the help of a huge quadruple twist, which represented a new personal best for both combined score and free skate score. While Canadians Meagan Duhamel and Eric Radford bested Sui and Han last season at the World Championships, the Chinese team’s continued Four Continents dominance, left Duhamel and Radford in second place with the silver medal and a total score of 212.23 points. The two-time defending World Champions had a series of small mistakes throughout their free skate including Duhamel putting her hand down on their side-by-side triple Lutz-double toeloop combination, and Radford turning that intended triple toeloop into a single, as well as Duhamel putting her hand down on their attempted throw quadruple Salchow. 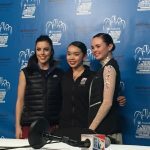 However they were able to move up from third place after the short program to second overall, increasing their confidence going into the World Championships. Fellow Canadians Liubov Ilyushechkina and Dylan Moscovitch won their first ISU Championship medal, bronze, with a total score of 205.31 points. They were able to move up from fourth place after the short program to third at the conclusion of the free skate. Ilyushechkina and Moscovitch skated a tender program to “When You Say You Love Me,” performed by Josh Groban, and their only mistakes were shaky side-by-side triple Salchows and a fall on their throw triple loop. Recently wedded Alexa Scimeca Knierim and Chris Knierim had an emotional return to competition following Scimeca Knierim’s illness last summer and subsequent stomach surgery in the fall. In their first competition since their wedding in June, they debuted two romantic programs to “Come What May” from the Moulin Rouge soundtrack (SP) and selections from the musical, Ghost (FS), and finished in sixth place with a total score of 193.91 points. Their free skate was highlighted by their trademark sky high triple twist and big triple throw jumps. 2017 U.S. Champions Haven Denney and Brandon Frazier had issues with their side-by-side jumps, but skated with good connection to each other and their music, finishing eighth with a total competition score of 179.45 points. Making their Four Continents debut as a team, 2017 U.S. bronze medalists Ashley Cain and Timothy LeDuc had two solid performances despite minor deductions on the landings of ambitious side-by-side jumps (triple loop and double Axel-half loop-triple Salchow combination) in their free skate. They placed ninth overall with a total score of 168.87 points. Though they had never competed at Four Continents before, it was not the first time that Cain and LeDuc had been in Gangneung, as they both competed in the 2011 World Junior Championships with different partners. Scimeca Knierim and Knierim and Denney and Frazier will represent the United States in Helsinki, Finland at the World Championships, March 29-April 2, 2017.